I have a customer that was experiencing some pretty major delays on the network. They initially purchased, some time back, all Cisco 3560s for a VoIP network. This worked fine at the time and has been pretty solid. But, as the network grew and demands changed, the core switch got really overburdened. CPU was at 70 to 90 percent most of the time. I put this FCX648S in and now they are happy. 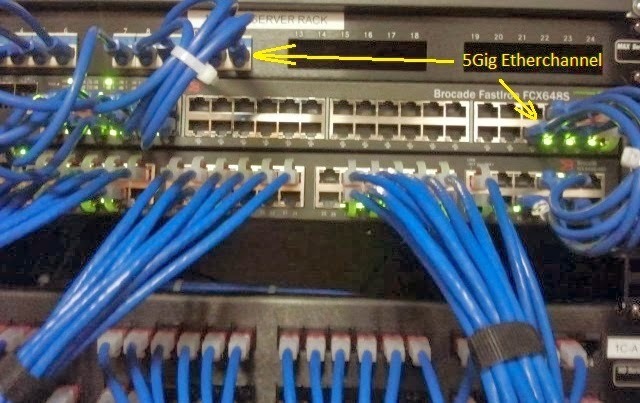 Hi, Great blog btw, I'm interested to know why you went with the ether-channel/LAG between the FCX instead of the 10G stacking cable. I'm guessing the ether-channel going to the patch panel is a LACP going to a cisco switch correct? Close, they had no 10g licence on the ICX6450, so I just made use of the extra gig ports. 10 gig would have been ideal, but no 10g licence.